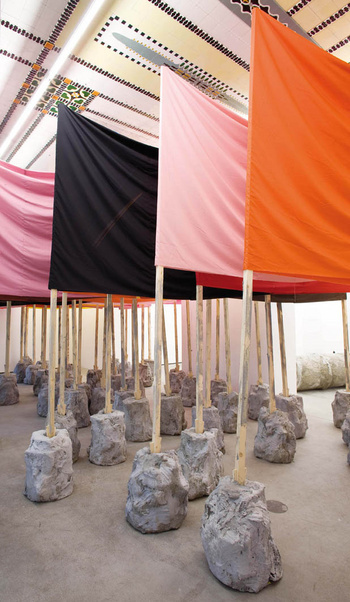 Waving the flag fro abstraction, Phyllida Barlow remains a unique British talent and has been so for the last 40 years. Her new exhibition entitled 'Rig' from 2nd September to 22nd October at Hauser & Wirth, London, shows little sign of her strength waning. 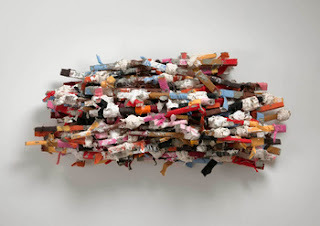 In this show she is using as usual a variety of materials from the urban environment of recycled ephemera, such as fabric, sticks, polystyrene and cement. Phyllida Barlow was born in 1944 in Newcastle-upon-Tyne, England. She lives and works in London. In the late 1960s, Barlow began teaching at the Slade School of Art as Professor of Fine Art. In 2009, she stopped teaching in order to focus on her own work.